I used a 4:1 mix of sharp sand and cement to stick them down and 2:2:1 sharp sand:softsand:cement for the pointing to get a slightly better colour. Seems to have stuck ok but plan to keep them fenced off for a week so it really has time to cure. After doing loads of work for a conservatory company, I noticed that the dwarf walls built during the winter rain were far stronger than those built in the summer sun. The adhesion from block to mortar changes hugely. Other builders have said to me that a house built in the winter is stronger than one built in the summer. The longer it takes to cure, the stronger it is. I have seen concrete floors floated, and the next day soaked with a hose to prevent it drying too quickly. I've lifted one row and removed existing mortar. looks like they used three different mixes to build the steps. 1) Mortar to lay the bricks - this seems sound, very strong and hard to remove. 2) A coarse sand/cement mix to bed the stone. It's this that seems to be weak. It's on the sandy side. Not crumbly but not nearly as strong as the mortar used to bed the bricks. Don't think they used quite enough cement in the mix. 3) A resin sand based grout in the gaps - this also seems rather weak. Wouldn't tolerate a pressure washer. Looks like I'll be giving the 4:1 mix a go when the weather allows. Normally you just need to wet the stone. You could try wetting the stone, mixing a small amount of cement and seeing if it sticks to the underside, I'd be surprised if it didn't but if you have no joy you could use an external cement based tile adhesive instead. Any ideas how to improve adhesion to the stone? Wet/don't wet it before laying? The stone seems quite impermeable. I'd just remove all the pointing, dig at least 10-15mm of the base out then mortar and point them back in with a 1:4 mix of cement and sharp sand. What you are suggesting may work but i doubt it and if it didn't you would have made a hell of a mess which would be hard to put right. 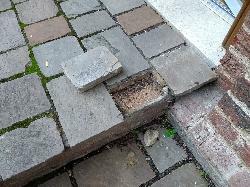 We have some brick steps covered with india stone squares and rectangles about 160mm (about 6.5") square and 1" thick. All fine for 10 years but now several slabs that overhang the edges of the steps slightly are working loose, typically leaving the mortar bed on the steps rather than the stone. How best to repair these. I'm wondering if I could remove any loose materials, use a resin to seal the mortar, bricks and underside of the india stone, then use something like a PU based adhesive to really stick the b----s down?